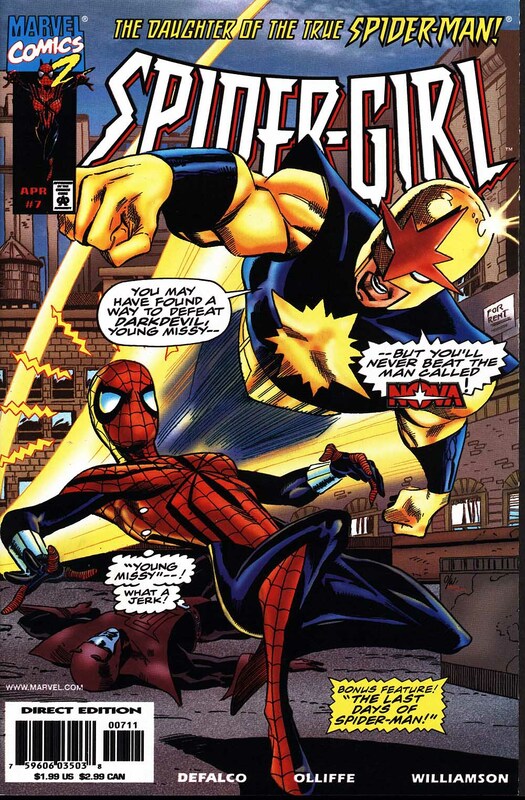 MC2 is short for Mavel Comics 2 and it’s understandable if you’ve never heard of it. It officially launched 20 years ago this month, although its origins began six months earlier in the page of What If? #105. That was the issue that introduced the world to an alternative timeline where Perer Parker and Mary Jane’s daughter (stolen away in the pages of the regular Spider-man books) hadn’t been taken and was instead raised by her parents. She would eventually discover that she had powers and that her father had been the Amazing Spider-man. The MC2 was an attempt to create a Marvel Universe that was more accessible to a mainstream audience. 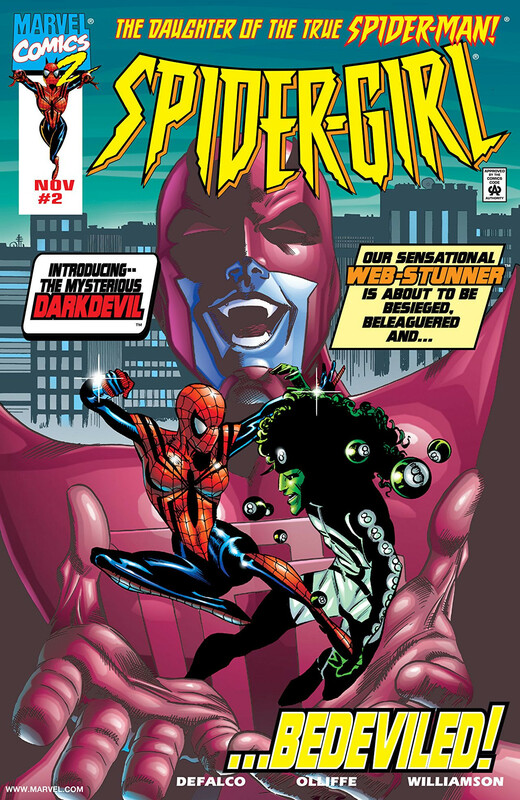 The comics took place in the near future and condensed Marvel history. While no official timeline was ever created, it appears that Wonder Man is the most recent Avenger to have been on the team, which places the cutoff in the late 150s of the Avengers comics, roughly 1976. The books take place in a near future and stylistically it’s not hard to imagine that meaning 15 years after 1976. These are an odd group of books to come out in 1998 because they aren’t remotely in keeping with what was en vogue in comics at the time. But given the state of comics at that point, that was the point. It was kind of an attempt at bringing readers back by turning back the clock. Specifically, the MC2 line was meant to bring back young readers. The major problem was that the books were supposed to have distribution in a number of mainstream sources in place like Kmart and Target, but that deal never happened and the books struggled to find an audience. The audience they did find were people like me — those who longed for some good old fashioned comic books in the Mighty Marvel vein. Honestly, it’s debatable as to whether or not these books would have appealed to young readers had they even actually gotten them. The line launched with three books: Spider-girl, A-Next, and J2. This is the only comic that anyone knows from MC2 and even that isn’t saying much. Spider-girl debut in What If? #105. She’s the daughter of Peter and Mary Jane, in theory the daughter that was taken away (and to my knowledge never talked about again) at the end of the Clone Saga. She’s named after Aunt May, who was dead at the time (the lengths Marvel went to in an effort to reset the Spider-man books after the Clone Saga were crazy stupid). May Parker’s original series lasted 100 issues which is insane given how long every other MC2 book lasted — and even how long the average superhero comic lasts. Even after that, she wasn’t done. Her book was relaunched multiple times with varying adjectives and she as been in print for more or less all of the last 20 years. Part of the reason Spider-girl lasted well beyond the rest of the line is that May Parker filled a void that had long existed: a positive, teenage superhero who was female. It’s impossible to name another character like that who had her own book for so long. Marvel is still regularly trying to replicate what Spider-girl did. There’s a lot to be said for the fact that Spider-girl did not exist in the Marvel Universe proper. Her book wasn’t hampered by crossovers or events. She also wasn’t overshadowed by a Spider-man or Spider-woman or any other member of the Spider Family. There were no other books in that universe after a year, so she was the premiere superhero. We saw that entire world through the lens of Spider-girl so it seemed like she was the most important character. Spider-girl had weight. Because she was the premiere superhero she was seldom put in a position where she played second fiddle and thus rarely ran up against sexism — not in that world, but in the story. She was never portrayed as less than anyone else because of her gender, but because of her inexperience. And that inexperience faded over time. She would have been an offshoot of a male character in the mainstream Marvel U, but in her world she was the focal point; she was no one’s second class citizen. Much of this came from Tom DeFalco treating her with respect or, at the very least, not writing her any different than he would have written a Spider-Boy. Yes, the fact that he chose to narrate the story in 2nd person could be a bit much, but it’s entirely possible that’s what appealed to so many people. And as much as I love DeFalco’s writing, it was Pat Olliffe’s pencils that initially brought me to the book. Olliffe’s work on Untold Tales of Spider-man was fantastic. Truth be told, I’d been following his work since he penciled Hero Alliance #10, which was the first indie superhero comic I ever bought. He is one of the best artists working today. He’s so good, in fact, that it was clear that as Spider-girl became a cult comic — and not a mainstream one — that Olliffe would no doubt get more high profile assignments elsewhere. Fortunately, Tom DeFalco had a long time collaborate he could call to be the new regular penciler: Ron Frenz. I normally enjoy Frenz’s Kirby via Buscema work and Spider-girl was no exception. He did change his style a bit, streamlining the characters so they looked less like traditional superheroes and more like, well, YA characters. He was aided and abetted on this front by the new inker, a guy named Sal Buscema. they worked perfectly together. Olliffe and Frenz became the definitive Spider-girl artists, to the point where no other artists really did her justice. 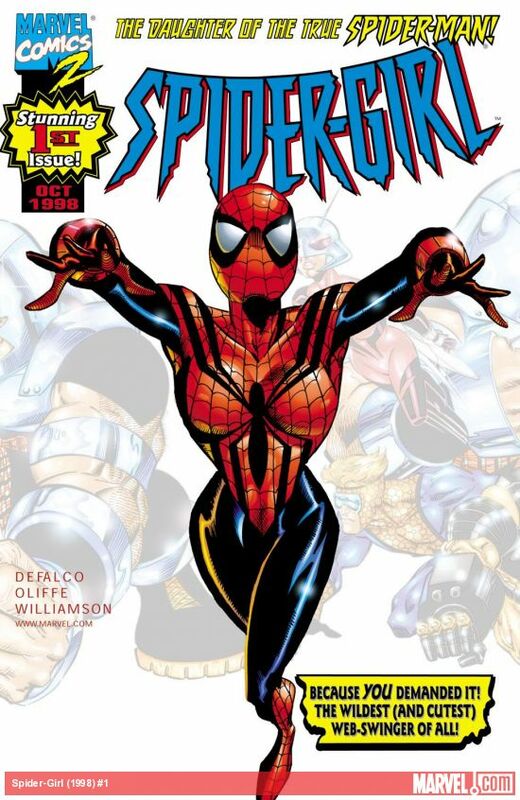 DeFalco was the definitive Spider-girl writer, to the point that no other writer has managed to get her right. Don’t even get me started on the awful Spider-verse crossover that resulted in the deaths of May’s parents. I’m just going to leave that alone for the sake of this already long piece. As the story goes, each of the initial MC2 title was meant to be a 12 issue series, to then be replaced by new, 12 issue series. 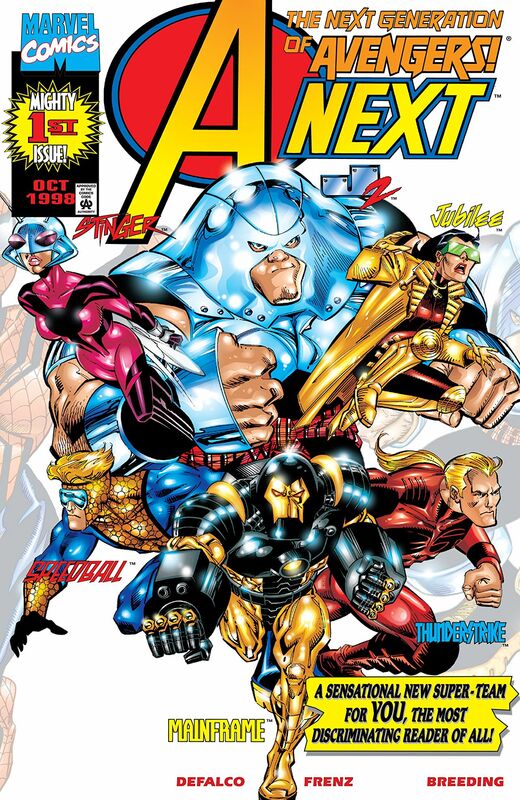 So while it’s entirely possible (probable, really) that A-Next would have been canceled at some point, it was given 12 issues and thus a complete story. When the series opens, the Avengers no longer exist. The team has disappeared and no one has replaced them. This is another hint as to where the MC2 diverges from the Marvel U; the Avengers are still a relatively small team. It was still possible for all of them to disappear on a single mission. As you might expect, a new team is formed in the first issue, made up of Thunderstrike (son of the original Thunderstrike, 90s fill-in for Thor), Stinger (daughter of Scott Lang), Mainframe (Iron Man-esque), and J2 (son of the Juggernaut). They’re joined by Jubilee and Speedball in the first issue, but those two, who are older than the others at this point, don’t stick around. It’s a close analogy to the original team, with a Thunderstrike as Thor, Stinger as the Wasp, Mainframe as Iron Man, and J2 (a human who transforms into a giant anti-hero) as the Hulk. Sticking with the analogy, issue #4 — the return of Captain America in the original series — features the addition of 4 new members that also might seem familiar: American Dream, Freebooter, Bluestreak, and the Crimson Curse. Yes, it’s Cap’s Kooky Quartet, MC2 style. Because the book was meant to be a finite series, the question as to what happened to the original Avengers is actually answered. It’s a fun comic, filled with all the over the top dialogue and cheesy characters you can expect in a DeFalco/Frenz production. Oh, man, this comic. It’s hard to even know where to start with this comic. Let’s go with the positive: DeFalco’s idea to create a comic with at least 2 complete stories in every issue is an admirable one. And more so than any of the other MC2 title, J2 is meant to be a light hearted, fun book. But the stories and characters are forgettable. Well, I suppose J2 himself is somewhat memorable if only because I still have no idea why he exists. Why the son of the Juggernaut? Of all the characters to use, why an X-Men villain? Was it an admit to align with the early days of Marvel, with the Avengers, Spider-man, and X-Men? And even if it was, there are just so many more characters who are infinitely more interesting than the Juggernaut. As it is, J2 is a standard nerdy kid who can turn into a crazy powerful superhero. It features some nice art by Ron Lim, though. 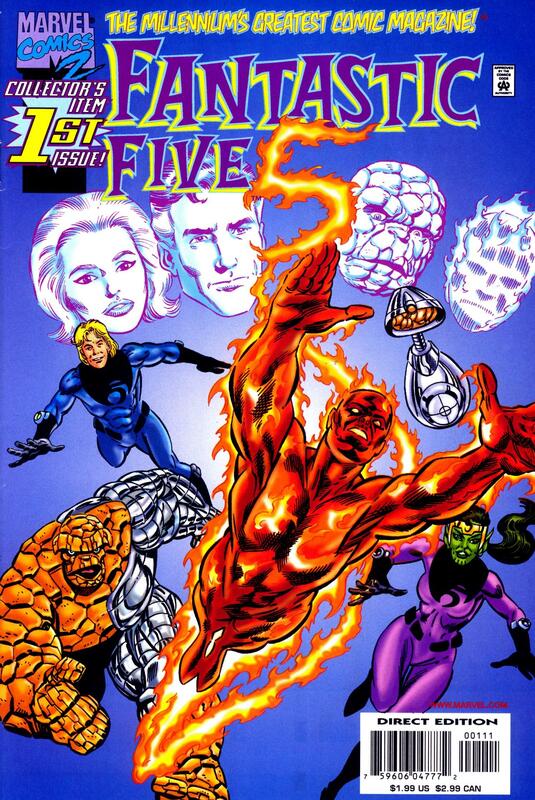 Replacing A-Next was Fantastic Five, yet another book that set up MC2 along the lines of the Marvel U. Much like how the Avengers went missing, Reed and Sue were supposedly killed. 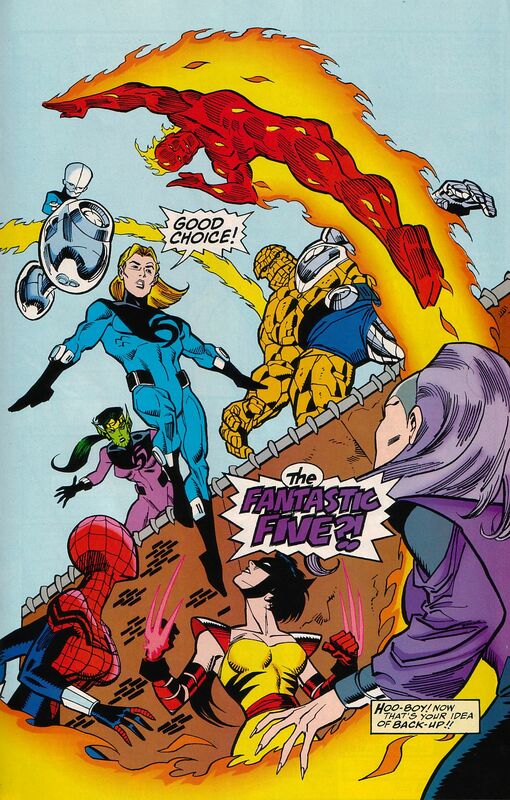 Ben and Johnny are joined by Franklin Richards (Reed and Sue’s son), Lyja (Johnny’s Skrull wife), and a H.E.R.B.I.E.-like robot called Big Brain (controlled by a hidden Reed Richards). If some of that sounds familiar (Franklin Richards being a superhero, Lyja and Johnny) it would probably seem even more familiar when you see the art by Paul Ryan and Al Milgrom. 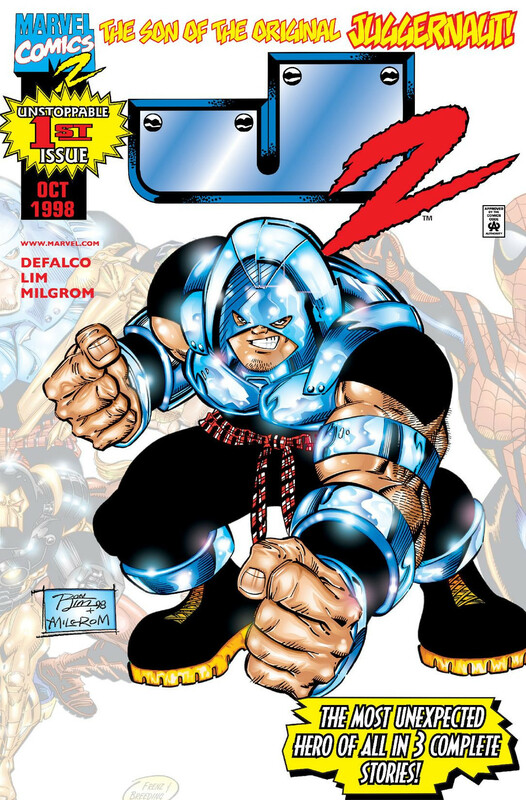 Ryan was DeFalco’s partner on a somewhat infamous run of the Fantastic Four. The FF would only have their own series for, appropriately, five issues, but it’s a fun book, full of the same old school Marvel feel as A-Next. And just like all the other series, each issue is chock full of story. As is customary when dealing with stories in the future, any heroes from the present must have children. Besides Franklin Richards, Johnny and Lyja have a son named Torus and Ben has a son named Jake and a daughter named Alyce. All three of them, of course, have super powers. The team got another limited series in 2007 which is impressive given how at odds the MC2 line was with the rest of what Marvel was publishing. While character come and go, the final line-up is still a mix of adults and kids, which I always thought was a mistake. This is the MC2; let the kids be the FF and send the parents on their way. Because the MC2 books took place in a theoretical future and because they were written in the style of the past, there weren’t a lot of elements that felt dated with regards to modern day pop culture. Wild Thing felt dated. It felt like DeFalco needed a name for the daughter of Wolverine and Elektra and turned on MTV. Or maybe he was watching Major League. I don’t know. But calling her Wild Thing sounds bad and doesn’t get any better after typing it over and over again. 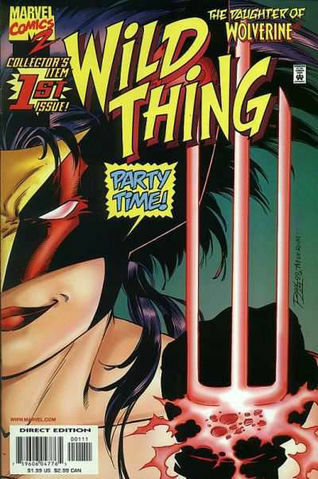 Wild Thing has the distinction of being the only MC2 book written by someone other than Tom DeFalco, specifically Larry Hama, who is joined by the J2 art team of Ron Lim and Al Milgrom. Each issue also featured a short back up story starrring — who else? — J2. Those were written by DeFalco and also drawn by Lim and Milgrom. The main problem with Wild Thing is that she’s just a bad idea. I understand the desire to use Wolverine and Elektra, particularly since this was the 90s and those two were immensely popular. But those characters are so tonally opposed to what the MC2 is that it makes no sense. Honestly, the fact that DeFalco didn’t write this book makes me wonder if it was just created in hopes of pulling in more readers. There’s nothing wrong with that, of course, but Wild Thing wasn’t a fit. Still, even with these dead end titles, the MC2 would continue to chug along for another decade.